As your resource for creating a better future through science, technology, innovation and entrepreneurship, SSTI provides you with: funding opportunities; timely information on how states and communities are investing in science, technology, innovation and entrepreneurship; customized technical assistance; and, the latest news affecting the tech-based economic development community. Join or renew today! The following table provides an overview of the most popular benefits of SSTI membership by member level. You can also download one-pagers on each level. Customized Technical Assistance — Customized technical assistance on research/analysis, strategic planning/peer review, advocacy/education projects. State and Sustaining members only. Funding Supplement Subscriptions — The Funding Supplement is a member-only electronic publication that provides readers with application information, eligibility criteria and submission deadlines for hundreds of funding opportunities offered by the federal government, foundations and others. Invitation to SSTI Senior Leadership Forum — One member of your executive team will be invited to participate in this exclusive meeting that is capped at 35 people. Members set the agenda for a day-and-a-half of freewheeling discussion and presentations from key federal officials. Invitation to State & Sustaining Member Dinner — An opportunity to relax and connect privately with other State and Sustaining Members and VIPs attending the annual conference. State and Sustaining members only. Conference and Webinar Discounts — Members receive exclusive rates for SSTI events, and the conference rate includes a further discount for additional team members sent from the same organization. 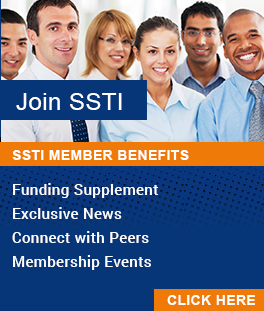 Access to Members-only Research — Gain access to reports and issue briefs SSTI has prepared to answer member questions. Member Listserv — 1990s old school but still one of the best ways to pose questions to your peers and tap into their wisdom. Conference Agenda Input — The chance to help shape the agenda at SSTI’s Annual Conference by suggesting conference content. Unlimited Position & RFP Postings — SSTI members can place an unlimited number of position openings or RFP (and RFQ, FRI, etc.) on SSTI's Job Corner, and each posting will also appear in the SSTI Digest. Listed on SSTI Website — Acknowledgement of membership status on the SSTI website and in publications that include a list of members. SSTI Digest — SSTI's weekly electronic newsletter provides readers with valuable, timely information on critical issues affecting the tech-based economic development community. Available to SSTI members as well as the general public. Subscribe Today! Join SSTI today. Together we can have the greatest impact on developing policies and administering programs that enhance our community. Membership is for the entire organization and based on a 12-month rolling cycle. Click each level name to download a one-pager with membership details. State Member, $5,000 — Open to state technology-based economic development programs with annual budgets in excess of $1 million. State Member, $2,000 — Open to state technology-based economic development programs with annual budgets below $1 million. Sustaining Member, $2,000 — Open to Affiliate organizations that would like to receive additional benefits, exclusive invitations to networking events and personalized technical assistance hours. Affiliate Member, $750 — Open to local and regional tech-based economic development programs, universities, venture development organizations, trade associations, publicly-funded seed and venture funds, tech councils, incubators, manufacturing extension centers, innovation districts, research parks, and other non-profit groups working to create a better future through science, technology, innovation and entrepreneurship. In addition to (or instead of) joining SSTI as a member, organizations can become engaged in the SSTI community through any of the following events, resources and services. For paid activities, contact us for combined or discounted invoicing. SSTI's Annual Conference — Each year, SSTI hosts an event with people who are shaping the nation’s innovation ecosystems to focus on best practices and current issues affecting the community. Organizations can participate as attendees or sponsors, if they wish to gain exposure with this core audience of national policymakers and practitioners. Learn more at ssticonference.org. Innovation Advocacy Council — The SSTI community's voice in Washington, DC for issues related to science, technology, innovation and entrepreneurship. Organizations can sponsor or participate in Capitol Hill events and sign onto letters of support. View SSTI's federal policy page for more information. SSTI Inspiring Thought Webinars — SSTI hosts Inspiring Thought webinars focused on topics of current importance to the innovation community. SSTI Digest — SSTI's weekly electronic newsletter provides readers with valuable, timely information on critical issues affecting the innovation community. Subscribe Today!